Nothing betrays your age like the music you like. A few weeks ago, fellow New Paper on Sunday columnist Neil Humphreys wrote about realising how old he had become because he was excited about the reunited Stone Roses coming to Singapore. Coincidentally, on the facing page in the paper was a column I wrote about how quoting a Carole King song would scare away young readers. The Stone Roses' heyday was in the late '80s. Carole King's heyday was in the early '70s. Needless to say, I'm a little older than Neil. Today in The Straits Times Life section, there's a cover story about big-name music acts coming to Singapore. 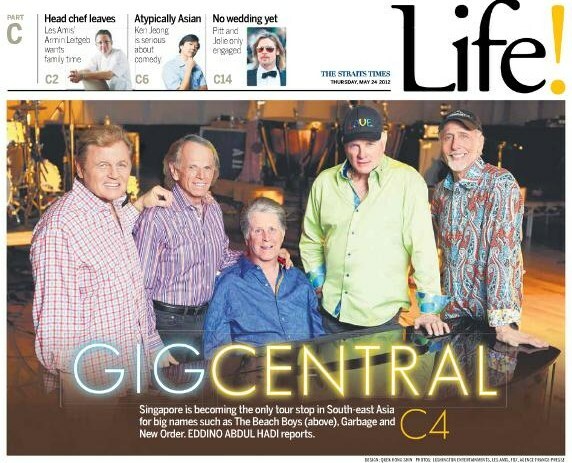 The cover photo was of the Beach Boys. I'm guessing whoever chose the cover photo is even older than I am. The article highlights New Order, Garbage and Snow Patrol, not exactly what I would call the latest hitmakers. Also mentioned are the Stone Roses and Train, the one act in the article I would consider current but already long in the tooth by today's standards. But you know which act I'm most excited about that's coming to Singapore? No, not Lady Gaga. Or Jason Mraz. I've never heard of Christina Perri, but I've heard of Gym Class Heroes. I'm a little excited about the Jesus And Mary Chain since I have two decades-old JAMC T-shirts. And I'm more mystified than excited that Dan Hill is coming. Of the acts coming for this year's F1 concert, which include Katy Perry, Maroon 5 and '80s favourites like and Bananarama, I'm most excited about the Proclaimers and the Pretenders. But the act I'm most excited about and actually considering paying good money to see is the Stylistics. What's holding me back is that only two original members are left and the original lead singer is not one of them. Like that how can? The Stylistics had a micro-revival of sorts a few years ago thanks to the use of I Can't Give You Anything in a series of Gatsby commercials. But Sing Baby Sing remains my favorite Stylistics song. What's your favourite Stylistics song? Or have you even heard of the Stylistics? Go ahead, betray your age. Cleopatra? No, it’s the Avengers’ next villain!